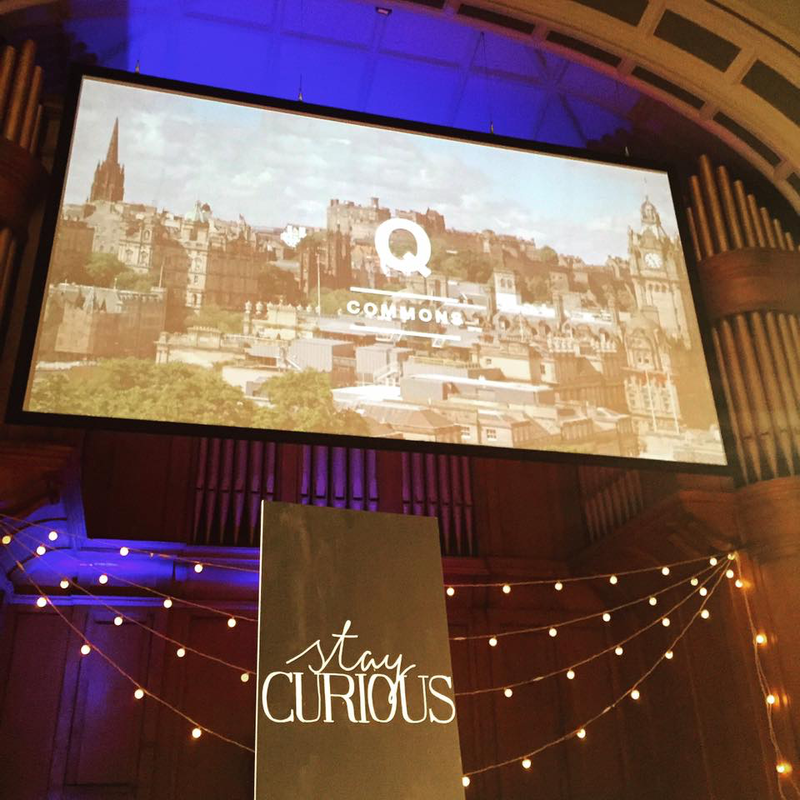 At the beginning of March, I had the privilege of speaking at Q Commons Edinburgh, as part of a global learning event. The evening was held at Central Hall and I had the privilege of sharing a platform with some fascinating local speakers and three global videocasts. Each speaker had 9 minutes to communicate their topic, and this was followed by discussion around tables. I was struck by how many common themes and threads emerged despite the varied mix of topics (Loneliness, Food Production, Refugee Crisis, Leadership and Millennial Spirituality). You can find out more about Q Commons by following the link above, and I’d highly recommend getting a ticket the next time the event happens, but in the meantime, here’s the text of what I crammed into my 9 minutes! I’ve been intrigued by the idea of incarnation and physicality for a while, and this was an opportunity to do some thinking about it. For those of you with a thorough grasp of the history of theatre, please forgive the surface-skimming nature of what I write. Truth is in the body. That’s not a biblical quote- it’s the mantra of a good actor. There’s a lot of mystique around the craft of acting but great performance is about taking a piece of text, or an idea, and bringing it to life physically. The more I think about this, the more aware I become of the disconnection that occurs when an actor plays a role untruthfully or glibly. It makes me complete pain as a theatre companion but causes me to strive for excellence in what I do. The Greeks first invented theatre using chorus, masks and ritual to entertain and educate and over time, as plots became more complex, a man called Thespis, a priest of Dionysus, introduced dialogue between the chorus and himself. Thus he became the first actor, or thespian. Skipping forward we encounter medieval liturgical theatre and mystery plays. Beginning with three monks reenacting the resurrection in 10th century Winchester, these plays became increasingly elaborate, culminating in the great mystery cycles of York, Wakefield, Chester and so on. Mystery cycles lasted a full day and led the audience through the entire biblical narrative. Town guilds had responsibility for a particular part of the story, the plays would be performed from trucks and the whole event served to reinforce the common beliefs of the community in a largely illiterate age. The mystery plays were an annual act of ritual celebration where everyone had a part to play. They were also bawdy, physical and contained biting satire. The nearest equivalent is probably the annual trip to the panto with well-known stories retold using familiar tropes, audience participation and local jokes. But let’s leave that behind us. Moving into the 16th century, we reach the golden age of Elizabethan theatre with Shakespeare, Marlowe and other actor-playwrights. These wordsmiths incorporated all the direction an actor needed to know within the text. Actors at the new purpose-built theatres worked from cue scripts – pieces of text containing the entrance line and the speech to be performed. This practice stopped actors stealing the stories and saved money on ink and paper. Broad movements and fight scenes were rehearsed in advance but otherwise, the actor had to read the text well to discover what to do on stage. Shakespeare represents the high point of text in theatre, and arguably all the Shakespearean actor had to do was, in the words of Spencer Tracy (who got it from Noel Coward), ‘say his lines and not bump into the furniture’. The clarity of the delivery was what mattered in a noisy, open-air, peanut-throwing environment. Incidentally, it has been estimated that one Londoner in 8 would visit the theatre every week during this period. Netflix for the 16th century punter. Alongside the growth of English text-based theatre, in Italy we see the development of Commedia dell’Arte, a form of theatre that involves stock characters in semi-improvised, highly physical scenarios played on the streets. Improvisation and physical comedy is rooted in this work, both of which have seen phenomenal growth in our times – there’s an interesting discussion to be had about whether this is purely coincidental given the cultural shift towards image and away from text. We’re skimming the surface of European theatre, and arriving in Russia, and the development of realism. The most famous exponent of this is Anton Chekhov, who perfected the art of the subtext, the idea that the truth lurks beneath the surface of the words that a character speaks. Actors love Chekhov because they have to work hard to find character. He understood that human beings are fickle and duplicitous, and that small lives are lived against the broader canvas of historical events. What human beings say is not always what they mean, and truth spoken subjectively. And so, the art of acting becomes more complicated. No longer is it enough to remember the lines and not trip up. Instead, the actor must mine the text to find the character then find a way of communicating this to the audience. Constantin Stanislavsky developed a system to help create truthful performance. He understood that the main meaning in Chekov is carried by what happens between the words, and his system involves assigning action to words in order to find this. Stanislavsky’s work forms the basis of modern acting technique. We’re ignoring Brecht, who communicated political thought by dispensing with any notion of character, and Beckett, whose sparse style explores existential philosophy through precise physical direction and repetition of words and actions. I’ve scratched the surface. And to what end? Because truth is in the body. We are living through a period of seismic cultural shift. Just as the invention of the printing press in 1440 fuelled the renaissance, the reformation, the enlightenment and the development of the knowledge-based economy, so the creation of the internet and technological advances in image and video production mean that the way we live is changing. And I think actors can teach us how a text-based community can communicate truth in a post-word culture. So, according to Hagen, there is no point in feeling an emotion unless it is then used to prompt the physical action of the performer. People understand what a character is thinking or feeling by what they observe them doing. And the job of the actor is to allow physical action to reveal the truth of the character’s inner life. It’s what Thespis was doing when he spoke to the chorus, what the monks in Winchester were doing when they put on headscarves and pretended to be Mary Magdalene. It’s what Shakespeare was coding into his scripts and it’s how we read the subtext layers between the words in The Seagull or The Cherry Orchard. I may speak certain words, but you will read what I really think and believe by my posture, my gestures, my physicality. And you will draw your own conclusion as to where truth lies. Thoughts, feelings and experience of God prompt us to action, and our character is revealed to the world by our actions towards it. So, from a place of worship, presence and intimacy with God we are prompted to care and love and build his kingdom. Otherwise, our faith is shown to be untruthful. Our experience of God through word and worship is not suspended in a vacuum, but must instigate and feed our actions. So, for example, what use is it for me to experience the overwhelming forgiveness of Jesus as I discover it in Scripture, unless I subsequently choose to live a posture of forgiveness towards others? Thus my character, our character, is revealed through our action. As the Greeks would recognise, anything else is hypocrisy. The church is a word-based community. Since Gutenberg invented moveable type we have had individual access to the Scripture. But we build our lives on the one who is described as the Word become flesh, full of grace and truth. Truth is in the Body. Truth experienced and incarnate. My profession pushes me to embody words well because, in so doing, I choose to show truth to an audience, not by means of talking them into compliance or giving them knowledge, but through leading them to identify with what they watch. They draw their own conclusion. That’s why the arts are not an extracurricular activity for the slightly flaky members of our congregation, but a means of rediscovering a community understanding of the Word lived out. Like the men of Issachar who understood the times and knew what Israel should do, the artists, and the actors, in our midst help us know what we should do. So, we need to release the stand-up comedians and the poets and clowns to embody truth in all its delicacy and robustness. By the posture and physicality of the Body, truth will be made known to a watching world. Truth is in the Body. I established Foolproof 8 years ago as a means of telling good stories, of embodying the message of hope in artistic ways so that people would discover their innate creativity, find community and encounter the creator. Increasingly, though, although I love performing, I find more satisfaction in investing in the next generation of performers and artists, because they understand this brave new world much better than I do. If we’re serious about communicating the message we carry, then we need to be serious about investing in those who embody for their generation and their particular industry. Another day, another thought. Usually when asked to write and broadcast Thought for the Day I try and inject a little foolishness into proceedings but on Monday, the day after the 20th anniversary of the Dunblane shootings, it felt appropriate to offer a more sober reflection. 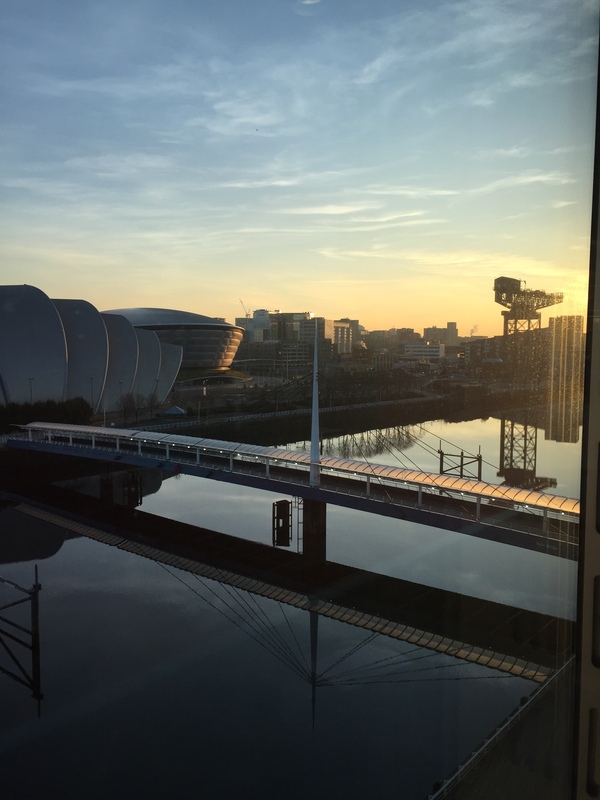 The view from the window of the BBC at Pacific Quay shed light on proceedings as I waited to go into the studio. Still reflections of light as darkness was dispelled. In preparing I was struck once again by the beauty of CS Lewis’ writing in the Narnia books. He had a remarkable ability to express profound truth in simple form. I’d encourage you to find the full quote from The Lion, The Witch and The Wardrobe and remind yourself of the ‘deeper magic that exists in the stillness and darkness before Time dawned’. Yesterday marked the 20th anniversary of the Dunblane shootings. Stories of that bleak March day remain etched on our collective memory, and I’m sure many of us paused to remember where we were at the time. I was in a school in Cambuslang, and vividly remember the shock that filled our hearts as news spread. The nearness and familiarity of the situation made the unfolding evil even more horrifying and incomprehensible. I also remember the lit candles flickering in windows during the days that followed – candles that stayed resolutely bright as a mark of respect and sympathy, and revealed a determination that we would not allow the light to be overcome by darkness. Events such as these change things forever. Trust is shattered, suspicion increases and our awareness of the reality of evil in our world is brought closer to home. And as news of fresh acts of terror across the globe filters through we see that evil is as prevalent now as it ever was, and its effects are as incomprehensible. As we remember, and pray, for those who still live with the loss and pain of that day, we recognise the reality of evil in our world, and share a universal sense that this is not as it should be. I believe that within each of us there is a longing for a world free of pain and suffering, a nagging thought that there is more to life than the blind acceptance of darkness. CS Lewis wrote in The Lion, The Witch and The Wardrobe of “a deeper magic” that has the power to overcome evil. Aslan, the lion, explains to the frightened children “that though the Witch knew the Deep Magic, there is a magic deeper still which she did not know: Her knowledge goes back only to the dawn of time.” Lewis alludes to a bigger plan that exists outside of time, a plan that will bring an end to evil for all time, and will usher in justice and restitution. When faced with the problem of evil in our world it is helpful to read words that give hope. At the heart of the Easter message lies the hope of evil defeated. The promise of a new heaven and earth where there is no more death, mourning, crying or pain, because the old order has passed away, brings comfort when our hearts are sore and we have no more words. Darkness does not have victory over light.